NEW YORK, NY--(Marketwired - Jan 15, 2014) - Time Equities, Inc. launched the teaser website for its new condominium development, 50 West Street (www.50westnyc.com). The website launch marks the official commencement of the marketing phase for the long-anticipated project. The teaser website features a captivating video animation, produced by the award-winning branding firm DBOX. Set to an original musical score, the animation highlights 50 West Street's sleek, glass design and remarkable Hudson River and New York Harbor views. According to Time Equities, the full project website, along with a state-of-the-art sales center, will launch in the Spring 2014. "The teaser website launch is the first step in an exciting public rollout process for the project," said Francis Greenburger, Chairman of Time Equities. "We encourage brokers and potential buyers to visit the website to get a glimpse of what is to come." In August 2013, Time Equities announced that it had secured $400 million in construction financing -- including a $110 million investment from investment fund Elliott Management as well as a $288 million construction loan, led by PNC Bank. Ground breaking took place in October 2013, shortly after the financing closed. 50 West Street is strategically located in the heart of The New Downtown - at the crossroads of World Trade Center, Wall Street, Battery Park City, World Financial Center and Battery Park. Helmut Jahn, the internationally acclaimed architect, designed the tower. Danish designer Thomas Juul Hansen created the interior layouts and finishes. "Downtown is already a hot residential neighborhood, but by 2016 it will be on fire," said Greenburger. "We see tremendous new demand for high quality housing in this neighborhood spurred by, among other things, the opening of the World Trade Center. We see interest coming from New Yorkers and international buyers alike." 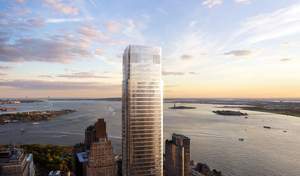 50 West Street is anticipated to achieve a LEED Silver certification. It will feature numerous floor plans and home types as well as an over-sized amenity package and a world-class storm-proofing system. Construction completion is projected for 2016. Time Equities' in-house residential sales team will be the exclusive selling agent with The Marketing Directors acting as sales and marketing consultants. The Albanese Organization is serving as development manager, Hunter Roberts as Construction Manager, and SLCE Architects as executive architect. Founded in 1966, privately held Time Equities, Inc. (TEI) has been in the real estate investment, development and asset & property management business for more than 40 years. With properties in 25 states, four Canadian provinces and Germany, the TEI portfolio consists of approximately 22.1 million square feet of residential, industrial, office and retail property. For more information, please visit www.timeequities.com. About this company Time Equities Inc.
50 West Street: Time Equities Inc. is developing 50 West, a new 63-story condominium tower located in Downtown Manhattan. Internationally acclaimed architect Helmut Jahn designed the tower's facade while Danish designer Thomas Juul Hansen created the interior layouts and finishes. Rendering credit: DBOX.